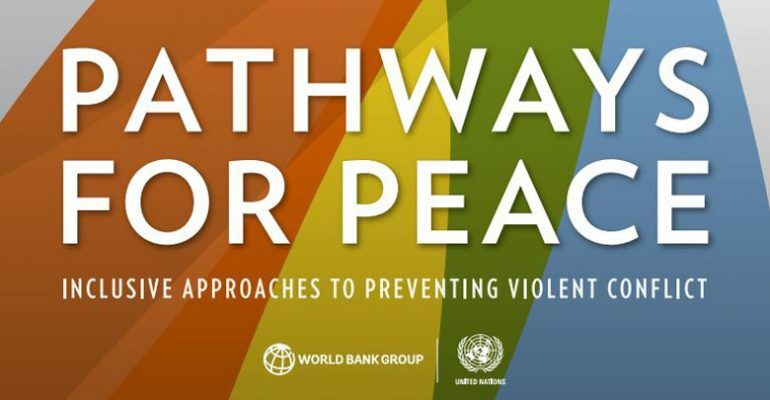 This year a joint report from the World Bank and the United Nations was released called ‘Pathways for Peace’. The report focussed on peace, peacebuilding and the prevention of violent conflict. To discover the ins and outs of this report, an interview was conducted with the senior advisor and co-author of this report: Seth Kaplan. Pathways to Peace tells the story of how violent conflict has changed throughout the last decades. Violent conflict has been influenced by many things, such as the influence of the developmental process and the evolution of preventing violent conflict. The paper does this by reviewing the experiences of different countries and institutions. Within these case studies, it tries to find out what works, and what doesn’t. The main focus is on group-based conflict and how exclusion from access to power, opportunity, and security can lead to grievances. Specifically, Pathways to Peace discusses the importance of decentralization as an instrument that can promote peace. Decentralization is a process with the eventual goal of transferring some degree of power and authority to local and regional governments. Nowadays many states have socially fragmented societies with different groups, clans, ethnicities, and religions dividing the country. These minority groups can often feel ignored and alienated by the national government, as these usually only serve the majority. Decentralization allows states to empower and manage the divisions between the groups. Mr. Kaplan explained that “the more you empower different groups, the less they feel alienated from the state, and the less likely they will take up arms.” He, however, also acknowledges that there is no panacea, no one way to solve all situations: it is all dependant on the context. It thus should also be taken into account that decentralization can lead to negative effects, such as fractious competition for power, state capture, and excessive corruption. Nonetheless, Kaplan says it was hard for him to “imagine having sustainable peace without decentralization” in some context. Complementing these policies, it is necessary, he says, to think of ways to connect different groups in ways that bring people together. Local and regional governments need to be equitable and representative of everybody. As such, elections can sometimes be exclusive by marginalizing minority groups. And decentralization that is not paired with a broader strategy to bridge differences between groups can be limited as a strategy. The key questions here are: How can social cohesion be increased? What (social) bridging mechanisms can be used to prevent or diminish exclusion from happening? Beyond the state or municipality borders, how can we reach out, work together to manage conflict, and find inspiration in unity? One way of finding this, outside of this interview, is, of course, the UCLG Peace Prize. The UCLG Peace Prize provides examples and inspiration of successful peacebuilding initiatives initiated by local and regional governments, such as the 2016 winner, the Municipality of Kauswagan, with the ‘From Arms to Farms’ programme. Through news articles on our website and through social media, we also share recent and important publications and developments in the area of peace, such as the Pathways to Peace report discussed here. Do you want to inspire other municipalities? The applications for the UCLG Peace Prize have already opened, and will remain open until April! Cities, the new frontier for peace mediation? The Prize celebrates successful initiatives undertaken by local governments and stimulates others to follow suit.